Driving to Work from Paul Sanders on Vimeo. Another test of the new camera. I dig the image quality. Short video taken with the Flip. I think TWC didn’t like me uploading so many files all weekend to the various places so I was not able to get these uploaded at home. No such problems at work…. here are the raw files from the camera. My latest hosting plan from Site5 includes unlimited bandwidth and storage space so I may host future videos myself if I can find a nice way to present them. Probably still put them on Viddler or Vimeo too. 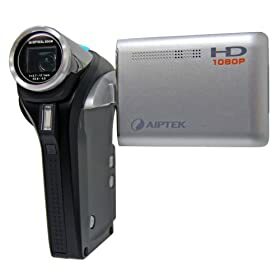 I’m not money like db, but I did buy a new video camera last week – the Aiptek Action HD GVS 1080P High Definition Camcorder. I love my Flip but ever since they brought out their HD version I’ve felt, well, a little resolution envy. At CES Sony brought out the Webbie that looks great and takes really good HD footage (for the price) but just as I was about to pull the trigger on it, I read about this camera and it has something that none of the others have: an external mic input. I’ve posted a Flip video from the cockpit before and you may recall that it suffered from (at least) two problems: you can clearly see the prop spinning in the video, and all you can hear is engine drone (and me if I shout). This new camera should give me high definition pictures AND allow me to plug the radios into the camera thereby letting you hear all the air traffic control goodness. Look for a test of that in the next couple of weeks. A Series 2 TiVo with a large hard drive in it – I put this on Craigslist at a steal price but all I got were people asking if I had a (transferable) lifetime subscription to go with it. I don’t. No one wanted it. Dell Axim X51v which I used to use as my aviation GPS. I tried selling this on the forums that support the aviation software but only two people were interested and they wanted to buy it, and my software, for about a quarter of the ‘as new’ cost. A Sony MiniDisc unit. So MiniDisc never caught on in the consumer market but it was a great platform for music. When I had my MiniDisc player stolen out of my Jeep (along with all my MDs) I gave up on the format. I doubt anyone wants this, either. And I’m sure there are other things too. I suppose I could take them to some e-waste site for free and at least be rid of them, but it saddens me that no one wants any of it. Last week, Teri, my Dad and I went to Applebee’s in El Centro and had without doubt our worst restaurant experience in a while. We ordered Samuel Adams drafts and they just tasted bad, quite sweet and the colour was all wrong. We sent them back and the manager bought new ones but they looked identical to me. Dad thought his tasted ok, I was still dubious but we kept them. By the end of the meal neither of us had drunk more than half the glass – they were not good at all. Meal over, our waitress came to give us the bill, more apologies. But the bill had a charge for both the Salmon and the unwanted Orange Chicken so we had to get her back to correct it. By this time I am sure she just wanted us gone so she could forget about the whole thing. So we paid the bill and left. I was a little surprised that we didn’t get something comp’d but maybe this level of service is the norm?